Many thanks to the tens of thousands of you who took action to ban Israeli settlement goods. We had an incredible response – over 50,000 actions were taken urging the UK government to ban trade with the illegal settlements. For over 50 years, Palestinians have been forced from their homes, detained and killed – all to make way for more illegal Israeli settlements. Products from those settlements often make their way into UK markets and onto our shop shelves. These products are made on stolen land, with stolen resources, and profit from human rights abuses. Our government must do more to stop this. On Monday 3 December, we handed in our petition to the Foreign Office, along with a spoof festive hamper of ‘Israeli settlement goods’. 'The UK and other governments need to enforce a ban [on illegal trade with settlements]. Otherwise they are complicit in breaching international law and giving comfort to the occupation and theft of Palestinian land. Our petition hand-in comes at a time when the illegal Israeli settlements are in the headlines. The week before, Airbnb announced that it would withdraw 200 property listings in the occupied territories. The company said the move recognised that the settlements are 'at the core of the dispute between Israelis and Palestinians'. Olive oil, wine, dates and oranges are just some of the thousands of products from Israeli settlements that end up on our shelves. No matter how delicious they are, products like these are tainted by the illegality of the settlements and by discrimination and violence towards Palestinian people. 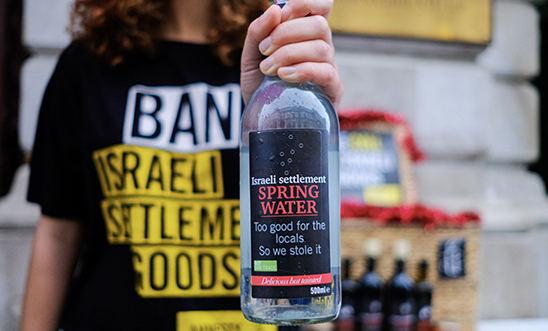 In the New Year, we will be launching a new campaign targeting some of the businesses that are profiting from human rights abuses by operating in the illegal Israeli settlements, but we will also continue calling for the UK government to ban Israeli settlement goods through our advocacy. We want MPs to take a tougher stance on illegal Israeli settlements in the occupied Palestinian territories, because this is what will lead to a ban on Israeli settlement goods. You can help us achieve this by writing or talking to your MP about how by trading with the illegal settlements and allowing companies to operate within them the UK is enabling human rights abuses against Palestinians. You can also create your own Delicious but Tainted goods by printing our spoof labels and attaching them to bottles and jars at home. These products can be a great conversation starter - use them to talk to others about the illegal settlements and about settlement goods. You could even give one as a gift to your MP when calling on them to ban Israeli settlement goods. For 50 years Israel has occupied Palestinian lands, forcing Palestinians from their homes. This land has been used illegally, to house Israeli settlers and produce millions of pounds worth of products that are sold around the world, including in UK markets. The money made in this way allows the settlements to profit and thrive. By allowing the sale of these goods in UK markets, the UK is indirectly supporting the expansion of illegal settlements and sanctioning the associated human rights violations.